Here, then, is the fourteenth instalment of the story of how Mary Jones and Thomas Charles triggered a mission to the world. Mary’s husband, Lewis, served as an elder in Bethlehem chapel in the village. “He was rather a simple character,” one writer said of him. The Calvinistic Methodists brought him under church discipline in 1843 for an offence which apparently was not serious. Mary soldiered on, like so many, especially the poor in these days, learning to live with death. Her faith held and she was noted for her faithfulness at church, her punctuality at meetings, and her love of the Bible. Mary read her Bible daily as long as she was able – reading it right through four times during her life – and she learnt large portions of it by heart, which was useful after she lost her sight. She could recite whole chapters of Thomas Charles’s Hyfforddwr “The Instructor” – his catechism on the principles of the Christian religion – and was fond of the poems of the seventeenth century poet and preacher, Rhys Prichard. Often she followed visiting preachers from meeting to meeting for a whole day on their visits to the area, even when she was quite old. Despite her poverty, Mary gave generously to her church as well as regularly to Bible Society. She was also a donor to her denomination’s missionary society, and the first section to which she turned in her monthly magazine, Y Drysorfa (The Treasury), was the “Missionary Chronicle”. Later in life, when her sight failed, she had to rely on others to read her Bible and favourite magazines to her. She had only a small garden. It was full of various types of fruit, and innumerable bees. She would be there on a fine day in summer like a princess in their midst, and she could pick them up in her hands as if they were corn, or oat flour, without one of them stinging her. She kept the income from selling the honey for herself, but divided the income from the sale of the beeswax – which could be a quite considerable sum – between Bible Society and the Calvinistic Methodist Missionary Society. She believed the reason the bees never stung her, and that their honey and wax was so plentiful and of such good quality, was that the bees knew that she dedicated part of the income to their Creator. Although we know that Mary met Thomas Charles from time to time until his death in 1814, we are not sure how much she knew about her role in Bible Society’s foundation – or how she thought about this. On 19 September 1853, the General Committee of Bible Society passed a resolution to print immediately one million copies of the Chinese New Testament. 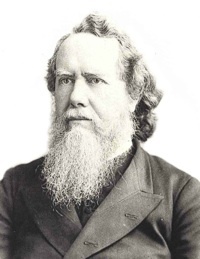 On the same day Hudson Taylor, one of the greatest missionaries of all time, set sail for China in the Dumfries, a small sailing-ship of only 470 tons and he was the only passenger. Auxiliaries and individual supporters all over Britain responded generously. In Bryncrug, Mary Jones, now approaching the age of seventy, donated a half-sovereign. The cost of a million Testaments (about £18,000 – not far short of one million pounds at today’s values) was fully subscribed by February 1854. Further contributions took the total to nearly £41,000 (around two million pounds at today’s values) by the end of the year and to over £52,000 when it closed. You can read the next instalment of this story on this blog tomorrow.